The offender was a social friend of the victim and had regular interaction with her, possibly on a daily basis. This familiarity with the victim, coupled with her good looks and flirtatious personality, helped foster his strong amorous feelings for her. Littleton clearly did not have much contact with Moxley, if any. In all likelihood, he had no idea who she was prior to October 30, 1975. 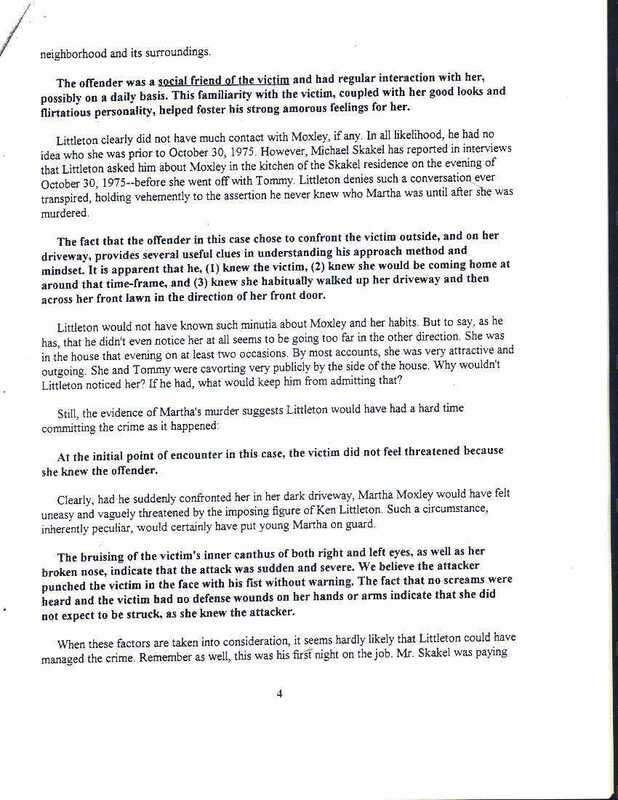 However, Michael Skakel has reported in interviews that Littleton asked him about Moxley in the kitchen of the Skakel residence on the evening of October 30, 1975--before she went off with Tommy. Littleton denies such a conversation ever transpired, holding vehemently to the assertion he never knew who Martha was until after she was murdered. The fact that the offender in this case chose to confront the victim outside, and on her driveway, provides several useful clues in understanding his approach method and mindset. It is apparent that he, (1) knew the victim, (2) knew she would be coming home at around that time-frame, and (3) knew she habitually walked up her driveway and then across her front lawn in the direction of her front door. Littleton would not have known such minutia about Moxley and her habits. But to say, as he has, that he didn't even notice her at all seems to be going too far in the other direction. She was in the house that evening on at least two occasions. By most accounts, she was very attractive and out-going. She and Tommy were cavorting very publicly by side of the house. Why wouldn't Littleton [^] noticed her? If he had, what would keep him from admitting that? At the initial point of encounter in this case, the victim did not feel threatened because she knew the offender. Clearly, had he suddenly confronted her in her dark driveway, Martha Moxley would have felt uneasy and vaguely threatened by the imposing figure of Ken Littleton. Such a circumstance, inherently peculiar, would certainly have put young Martha on guard. The bruising of the victim's inner canthus of both right and left eyes, as well as her broken nose, indicate that the attack was sudden and severe. We believe that the attacker punched the victim in the face with his fist without warning. The fact that no screams were heard and the victim had no defense wounds on her hands or arms indicate that she did not expect to be struck, as she knew the attacker.